As I tell my guest: “It is a tough job but someone needs to do it.” The sunrise is the start of another day of work at Grizzly Bear Lodge and my second favourite is: “Every day is a good day some are just gooder.” And this looks to be one of the “gooder” days. This last photo was over thirty minutes after the first photo posted. We had watched the humpbacks feeding all this time and they had moved away from the Oliver Clark and it had started to slowly move away from the herring ball but the whales kept feeding in the area for another fifteen minutes. It was an experience my guest will never forget. 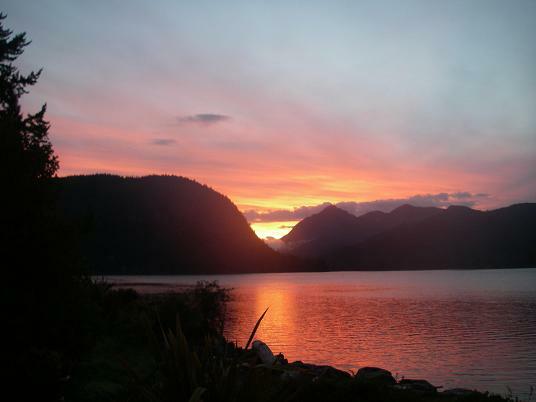 I know that it is one of the highlights of fifteen years of guiding for Grizzly Bear Lodge. Two minutes after the previous posting was the lunge that made the owner of the boat think he might need a larger boat. I know this because we stopped and talk and I eventually sent him a series of photos for his collection. This lunge was less than two meters (yards) from the side of the Oliver Clark…. 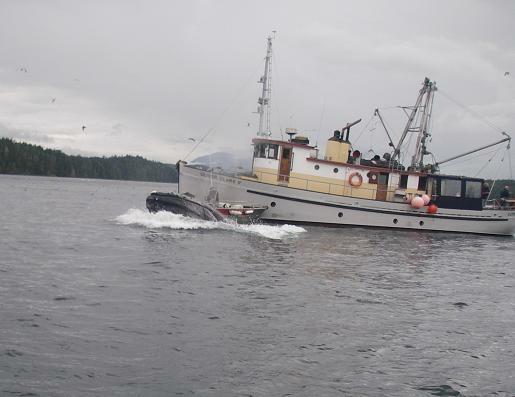 The boat is the 17 meters (55.8 ft) Oliver Clark II from Halfmoon Bay BC. The boat was drifting with engines off and this seemed to encourage the feeding whales. The lunges started away from the boat and slowly started to get closer to the herring, which were hiding under the boat…. 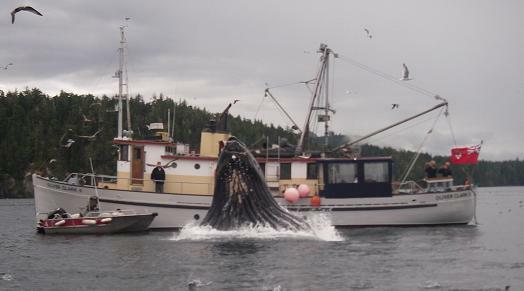 Contrary to the blog title this is not a photo of a humpback whale lunge feeding but it does show the reason for the lunges in the next four posting. 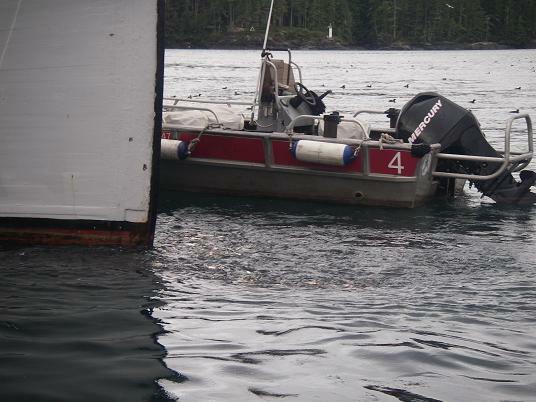 The boiling water off the bow of this boat and beside the skiff is a massive herring ball. 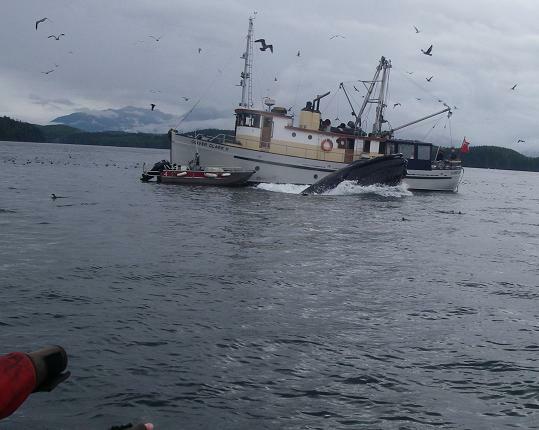 The ball or rather large school of herring surrounds the boat…. Watching grizzly bears from the viewing stands on the Glendale River is a little different that from a boat in the river estuary. This is especially true when the bear walks directly below the stand. This downward perspective truly shows the size and bulk of this grizzly. This is a “well fed” bear that is a long way to fatting for hibernation. 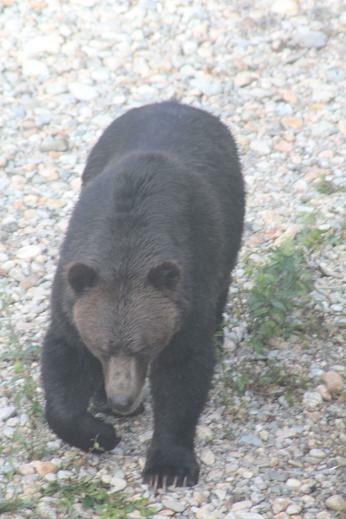 The photo was taken on September 2nd and means the bear still has two months to add additional layers of fat. Part of the reason for crossing the river was to join it’s sister on the far side. In the previous posting the sister was looking across the river at this scene and a freshly caught salmon is always an invitation. This process of grizzly bears moving up and crossing the river took about an hour but the guests did not feel that it was time wasted. As the grizzly came closer Rick started to talk to the bear and it listened. He has been in the valley for twenty-five years and knows the bears and they know his voice. Rick has great respect for the grizzlies in his valley and they accept his presence. 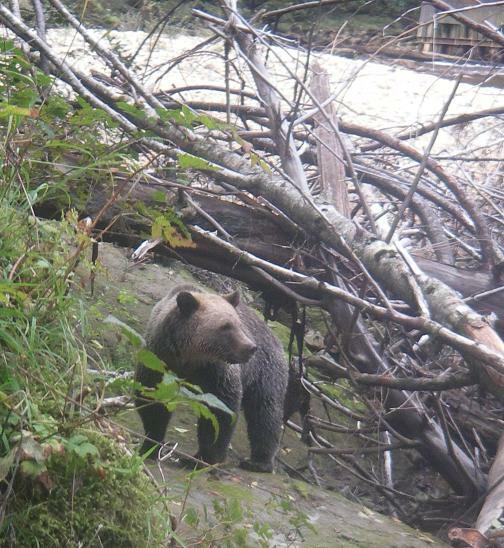 This grizzly turned and crossed the river…. The extra day in camp we cross Knight Inlet through Thompson Sound to the Kakweikan River and spend it with Trapper Rick. This river is located on the BC mainland and we travel by road to the river which we cross before a short walk to Rick’s cabin. 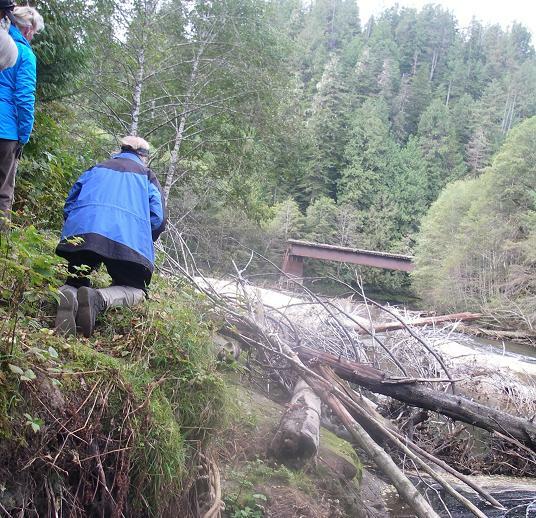 We arrived at the “boat pool” to cross and were stopped by a grizzly bear. 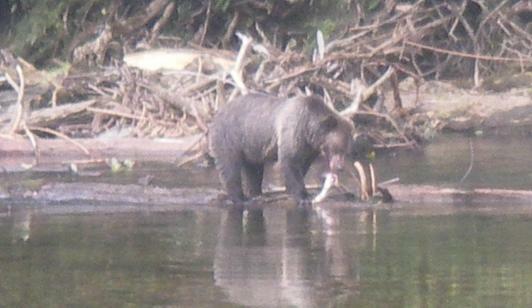 Rick is kneeling down on a three meter bank that over looks the river as a grizzly makes its way up river toward us…. Spending the hours we do in the boat on our tours from the lodge we frequently see bald eagles on the shore eating their catch. In this case the catch is a pink salmon we saw it pick from the water a few minutes earlier. 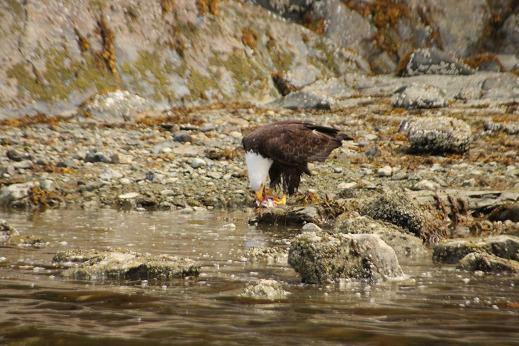 Until the salmon arrive in the rivers the eagles are more concentrated in the Johnstone Strait area where there is an abundance of herring which are a little easier to catch than salmon. If you have time to Google “Eagle Myths – State of Alaska” you will find one of the best article I have read on a bald eagles lifting powers “Eagle Flight and Other Myths Eagles Don’t Eat Children or Pets By Riley Woodford”. Short version: “best estimates put the lifting power of an eagle at four or five pounds.” The full article is definitely worth the time.